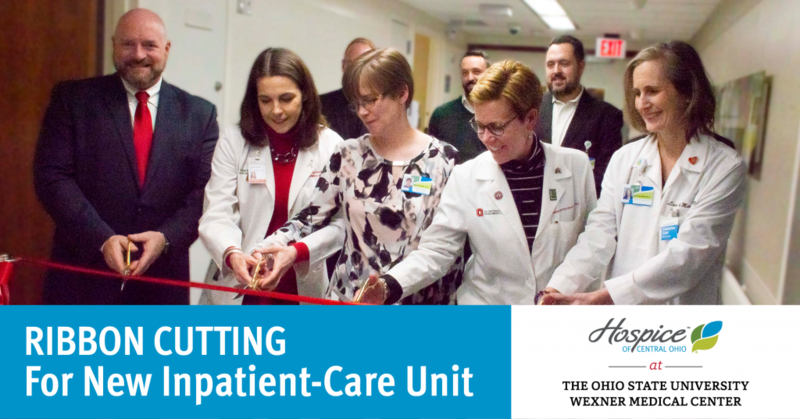 Ribbon-cutting ceremonies were held on Monday, January 28, 2019 for the new hospice inpatient-care unit at The Ohio State University Wexner Medical Center. Hospice of Central Ohio, an affiliate of Ohio’s Hospice, will operate the inpatient hospice unit. The unit features 12 patient rooms designed with a nature motif to create a peaceful environment for patients and families, along with flexible space designated for family gatherings. Families are able to stay with or visit loved ones 24 hours a day, 7 days a week. This innovative $2.5 million initiative, by Hospice of Central Ohio, will complement the continuum of care available for patients and will ensure that patients facing a serious or life-limiting illness receive the care, support, dignity, and comfort they need to have a meaningful end-of-life experience. “When we decided to add inpatient hospice services, we went through an extensive selection process to ensure we partnered with a not-for-profit organization with a strong commitment to providing the highest standard of care while supporting the communities it serves,” said David McQuaid, CEO of The Ohio State University Health System and chief operating officer of Ohio State Wexner Medical Center. Staff from The James Cancer Hospital remarked that they are grateful to have this unit so close for the next phase of their patients’ journey. Nurses shared their eagerness for the unit to open as patients will greatly benefit from having a peaceful, serene center available when inpatient hospital care is no longer desired. A grateful family member tearfully shared that she wished such an option was available when her sister was terminally ill a few years ago. She said she was pleased that other patients and families will be cared for so tenderly. Several supporters in attendance were excited to know that another inpatient unit offering superior care and service, will be closer to home. Their loved ones received exceptional care at the Selma Markowitz Care Center at Licking Memorial Hospital, which was created by Hospice of Central Ohio 22 years ago. Those interested in learning more about ways to support this project can contact Stacy Geller, vice president of philanthropic development with Hospice of Central Ohio, at 740.788.1488.